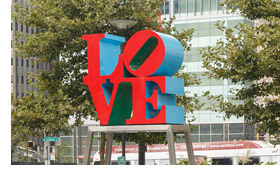 The LOVE sculpture leaves Dilworth Park for restoration on February 15, so we're seeing it off with four days of Valentine's fun, February 11-14! - Saturday: Free Valentine’s Day Floral Arrangement (10-11am), workshop in the Rothman Institute Cabin. Partner: America's Garden Capital. - Sunday: Sweetheart Skate (4-8pm) at the Rothman Institute Rink with 2-for-1 admission, free roses, photos, Rothman Cabin specials and more! Partners: SEPTA, Cardiology Consultants of Philadelphia and Subaru. - Monday: Skate. Pride. Love: An LGBT Soirée (6-10pm) with PGN and Delaware Valley Legacy Fund, a night of skating, music and fun! - Tuesday: Another free Valentine’s Day Floral Arrangement (12-1pm) workshop in the Rothman Cabin; Last Chance for LOVE (12-2pm), with free roses and music from MORE FM; and College Night (5-9pm), a perfect romantic evening for area students. Visit DilworthPark.org for complete schedules and details. Plus, all weekend- post your pictures at Dilworth Park on Instagram, tagged #LOVEatDilworth, and you could win a gift basket with tickets for a date to major attractions in Philadelphia, a bottle of wine, and a gift card for a romantic dinner! 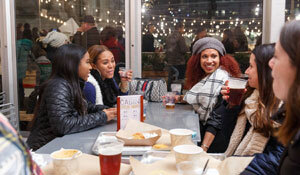 The Winter Season at Dilworth Park is presented by Rothman Institute, William Penn Foundation and through the generous support of Subaru, Capital One, The Philadelphia Orchestra, Temple University and 6abc. Warm up in the Rothman Institute Cabin at Dilworth Park with hot seasonal cocktails featuring Jim Beam Apple, Sam Adams craft beer and food from Brûlée Catering's Air Grille. Brush up on your skating or just watch, while enjoying the great food and drink. Adults 21 and over can order wine, cocktails and beer starting at 5pm on weekdays, and 11am on the weekends. For a menu and hours, visit DilworthPark.org/rothman-cabin. Try something new for Valentine’s Day and share the love with your favorite couples and friends! Aqimero's share-friendly chef’s tasting menu allows for four or more to toast to love and happiness together at Philadelphia’s iconic Ritz-Carlton, Philadelphia. Richard Sandoval’s "made from scratch" approach is reflected within each flavorful dish at Aqimero, with a menu focusing on sustainable seafood, steaks, ribs and poultry and an extensive list of mezcals. With marble columns and a three-story oculus letting in natural light, the grand lobby is the perfect place to celebrate the most romantic holiday of the year. The tasting menu is available February 10, 11, 14, 17 & 18 with seatings from 5-10:00pm. Get That Green Thumb Ready for Spring! Hey Cooks- the Library's Not Just for Books! Hone your cooking abilities and expand your palate with offerings from the Free Library’s Culinary Literacy Center! This month, stop by to get a taste of African heritage, learn knife skills by making French comfort foods, and build a better burger. To learn more about the Culinary Literacy Center and register for classes, visit FreeLibrary.org/cook. On February 22, in celebration of Black History Month, Joan Shepp presents the 17th year of celebrating Women of Substance & Style. The fashion boutique will be honoring African American women who make a difference in the community. The event is 5-8pm and will include an awards ceremony recognizing the accomplishments of the awardees, with an incredible evening of shopping, music, drinks, and food. Hosted by Tuesday Gordon. 10% of the proceeds from the event will be donated to the American Civil Liberties Union – to defend and protect the liberties of all Americans. Open to the public, rsvp to customerservice@joanshepp.com.